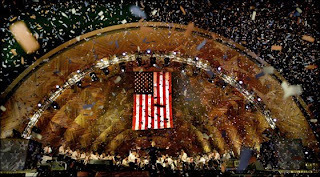 I sure hope I’m not the only one who still gets chills every year when the Boston Pops hits the final verse of “Stars and Stripes Forever” and the flag unfurls from the top of the Hatch Shell and the confetti shoots out from the machines on the sides of the Esplanade. It’s a fantastic, only-in-Boston moment, five of my favorite minutes of the year, and it never ceases to excite me year after year after year. My only real regret about the Pops show this year (and every year) is that the national audience doesn’t get to see and hear more of it. I’d love for CBS to start their broadcast at 9:30 instead of 10, so more folks can enjoy the great music — and not just the special guest and the lame, cheesy Patriotic Sing-Along. I also wish there were fewer commercial breaks between the songs, but hey, musicians that good deserve their breaks. And those fireworks? Awesome, as always. Colors bright enough to light up the entire sky. Booms loud enough to be heard out by B.C. “I’m Shipping Up to Boston” was predictable but fun. I’m such a sucker for fireworks, and the Boston ones do it for me each and every year. What a great day to be in Boston. What a great day to be an American.